NYC Tartan Day Parade – Scottish Terrier Club of Greater New York, Inc.
Home Posts tagged "NYC Tartan Day Parade"
Seen at the 2019 NYC Tartan Day Parade! Dawn Pohl and Kirby representing The Scottish Terrier Club of Greater NY at the 2019 NYC Tartan Day Parade! Some photos courtesy of Sally Fischel. Web design and some photography by Dana Johnston. ©2018 All rights reserved. 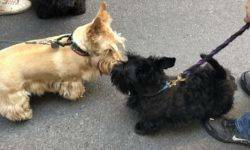 Scottish Terrier Club of Greater NY, Inc.